Growing up, birthdays were not a big thing in my family. We didn’t have a great big extravagant party, or get tons of gifts. My mother would make us whatever we wanted for dinner, followed by a few gifts. Honestly, I don’t remember the items that I received on my birthdays as I grew up. However, the thing I do remember is going out to eat with just my parents and I. Growing up in a family of 8 kids, as you can imagine, having one on one time with Mom and Dad was few and far between. Our birthday dinner was special. It is what I remember the most about my birthday. I recently visited my brother and his wife where we spent time talking and laughing til late at night (ok if you can call 11:00 pm late…..bah ha ha). They shared with us such a fabulous idea that I fell in love with. Every month they have an unbirthday with each of their kids. On their unbirthday that child gets to stay up with Mom and Dad for an extra 20-30 minutes. Think of that precious 20 minutes you get to spend one on one with that child! The great part is that the child gets to choose anything they want to do during that 20 minutes. My husband and I have decided we are going to incorporate this great tradition in our home. I love the idea so much, and I know my boys will go crazy over the idea! This is my kid’s favorite thing to do and is also one of the easiest to do. This is my husbands favorite thing to do with my boys! He love breaking out the ice cream and all the toppings to go with it. Who doesn’t love cookies and can be a treat to share with the rest of the family the next morning! Always a winner and sooo good for your child! Life is too short to be serious all the time! Make memories and laugh with your kids. I love these moments I get to talk with one child without any interruptions! I learn a lot about my children during these times. Each child will be different and this is something my 3rd child loves to do! This is something we don’t get to enjoy in our house full of boys! A good game of HORSE is perfect for this activity. I loved playing catch with my brothers in my backyard growing up. So many fun memories. Listen to music while baking cookies OR use this time to go through your child’s play list and music. Pick out some new uplifting music to add to their list. Another fun idea that ends in laughs! There is something about sitting down with only mom and dad that makes you feel loved. Especially when your full attention is on their TV show they like to watch. Walking can help break the ice a little bit for your child who doesn’t like to talk a lot. Ask lots of questions or just listen! Get your star constellation app on your phone to tell you where are the constellations are! Super fun! The list could go on and on. Taking the time to spend one on one with your child shows that child that they are IMPORTANT and what better way to do that than on their happy unbirthday! Spending time with my parents one on one is truly one of the only things I remember getting for my birthday each year. It was a treat. 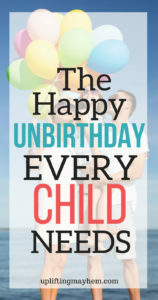 Having a happy unbirthday with your kids will be something they look forward to and will never be forgotten. My brother said their kids never let them forget their unbirthday! Enjoy! 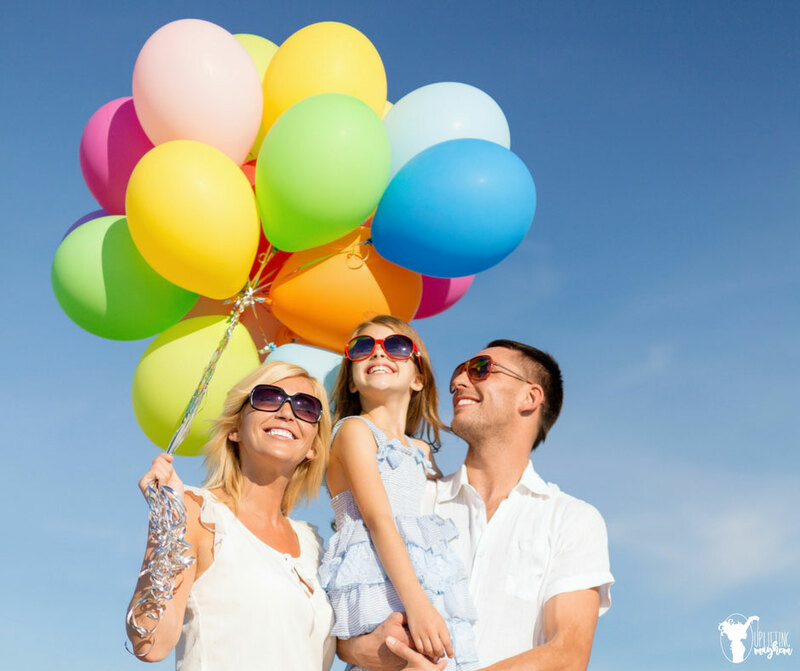 This time may be some of the best memories your kids may have with you! !